Justin Bieber decided to add some more ill-advised ink to his body — this time in the form of a sports team’s Native American logo, complete with headdress. Just in case his praying hands with roses, crown, and owl tattoos weren’t ugly enough, he chose to be politically incorrect and insensitive in supporting a sports team who uses native americans as a mascot or logo. On Sunday, Justin uploaded a photo of said new tattoo to his Instagram page along with the caption, “My grandfather always took me to the stratford culliton every friday night this is for u Grampa … My man @chenterios hooked it up.” The Stratford Cullitons are a junior hockey team based out of Ontario, Canada. At first glance, we thought this tattoo must be fake. The sketchbook-quality shading looks like something you’d doodle with a pen, not a tattoo needle. But upon closer inspection of the Cullitons’ logo, we’ve deduced that this style of tattoo mimics the original perfectly. It appears as though Justin Bieber actually tattooed a Native American sports logo on his left shoulder. Now, we all know that Bieber is a huge hockey fan — he’s from Canada, where liking hockey is virtually required for citizenship — but tattooing a sports logo on your body that is offensive to a whole race of people represents a whole other level of fandom. Use of native american mascots and logos by sports teams is a huge issue to native americans. 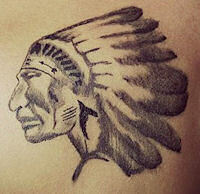 Remember Justin, this will be on your body for the rest of your life, and is offensive to most native american people.